Childbirth is one of the best moments of one's life but it can also cause unexpected changes in a woman's body. Carrying the weight of a baby in the pelvis, then passing the baby through the birth canal can have an exceptional effect on the structure and function of the muscles, nerves and connective tissue that makes up the pelvic floor. With all of the challenges that can come up in delivery such as larger babies, twin deliveries, or tears in the pelvis, there is a chance that bladder leaks (Stress Urinary Incontinence) can occur as a result. This happens in up to 30 percent of women. Stress Urinary Incontinence (SUI) is defined as an involuntary loss of urine when exercising, laughing, sneezing or coughing. SUI can affect women's quality of life by impacting their physical activity, sexual and social lives, and their emotional health. It's one of the most common types of urinary incontinence in pregnant women and postpartum, but it's often easily managed. One of the ways to help decrease the chance of having SUI after childbirth is to perform pelvic floor exercises such as Kegels, which will help tone the pelvic muscles and help decrease the rate of urinary symptoms, particularly of severe incontinence. They will also help reduce postpartum urinary incontinence. With support and encouragement, mothers can continue an exercise program for their pelvic floor muscles over at least one year with good results. 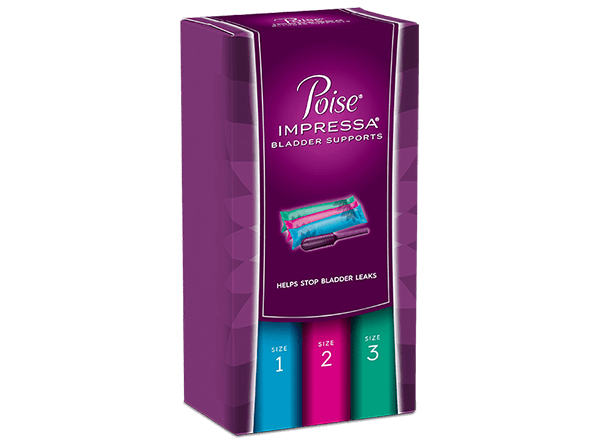 Starting three months after birth, using Poise® Impressa® Bladder Supports can help stop bladder leaks. They can be bought over the counter and worn during activities that may cause leaks to help women regain their confidence as they recover from childbirth. If you are interested in starting use of Impressa® soon after childbirth, see your health care provider before getting the Sizing Kit to make sure there are no infections, heavy bleeding or complications from delivery that need to be addressed first.